Learn how to organize your devices with the help of sites, filters, and groups. A filter in Datto RMM is a tool that is used to sort through a large number of devices. Filters rely on device audit data and are available at both the account and site level. A filter can be configured with certain criteria to target specific attributes of a device. It can even be set up to locate devices with specific software. Filters are dynamic and work independently of sites so you can have a filter that looks for devices with specific criteria across all sites. As device attributes change, the filters will automatically be updated and all the devices that match the filter criteria will be displayed in the filter results. Filters are a fundamentally critical part of Datto RMM as they can effectively target the right devices with reports, monitors, jobs, patch management, etc. If your servers go offline, for example, you can target an online status monitor at your servers with the help of a filter. To see how filters work in a policy, refer to Manage policies. There are a set of Default Device Filters available in every account in Datto RMM. You can use them to filter through all of the devices in your account or just in one particular site. To filter through all of the devices in your account, click Sites and locate the Default Device Filters area in the left navigation pane. To filter through one site only, go to Sites > click on one of your sites and locate the Default Device Filters area in the left navigation pane. Application Contains filters for applications, such as Adobe Flash, Java, Microsoft Office. Backup solution Contains filters for backup solutions, such as Autotask Endpoint Backup, Backup Exec, Veeam. Compliance Contains filters for devices that need your attention as they run out of memory, their antivirus is not running, they need a reboot, etc. Operating system Contains filters for operating systems, such as Linux, Windows, macOS. Role Contains filters for servers, such as DNS servers, domain controllers, SQL servers. Security software Contains filters for security software, such as ESET, Kaspersky, Webroot. Status Contains filters for device status, such as network node, offline, online. 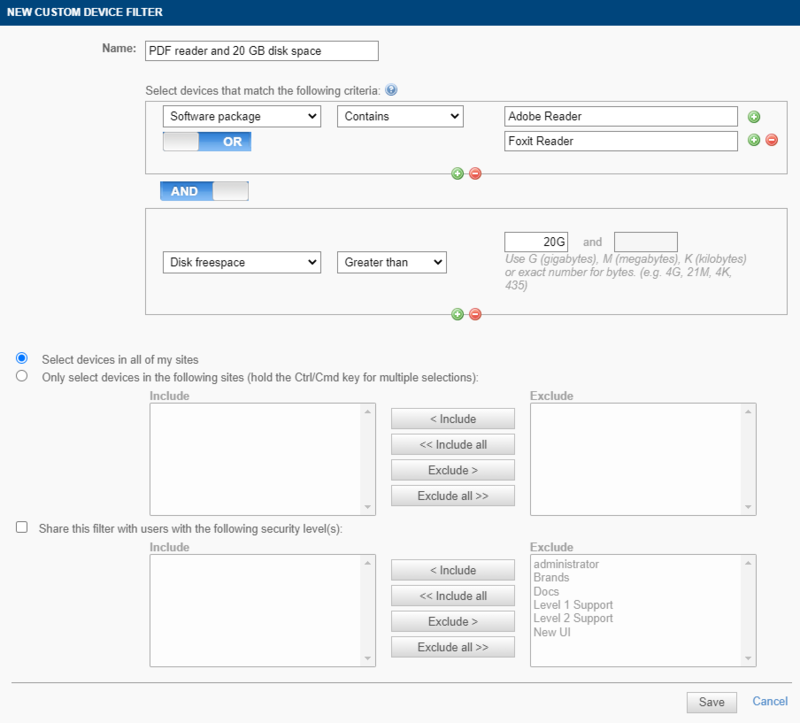 Type Contains filters for device types, such as all devices, ESXi devices, local caches. Expand a category to be able to see the various filters within it. The Default Device Filters provided by Datto RMM cannot be edited or deleted. To understand how they are configured, refer to Default Device Filter definitions. Click on any of the filters to be directed to the list of devices that meet the filter requirements. You can also use the dynamic search above the filter categories. Start typing in the Search field and you'll be presented with the filters that match your query. The Search field can be used by hitting Ctrl + / on your keyboard, without having to use your mouse. The information is only stored for servers, desktops, and laptops. Refer to Status. Filtering on a pfSense device requires the device in question to be added as a Network Device, not an Agent Device. pfSense devices can have an Agent installed on them, but two separate device listings will be required, with the Network Device listing requiring manual (IP-based) addition. ESX devices are unsupported. This filter will not display them. Datto RMM's Default Device Filters are useful in many cases but you probably want to create your own filters to make the most of this functionality. Custom filters allow you to apply jobs, monitors or patches to a carefully selected subset of your estate. Any user can create filters that can be applied at both the Account level (Custom Device Filter) and Site level (Site Device Filter). You can filter on any bit of information that is pulled back and visible in the device audit which is updated at least once a day for Managed devices and at least once every 7 days for OnDemand devices. Go to Sites and locate the Custom Device Filters area in the left navigation pane. Click the green plus icon to add a new filter. Specify the filter criteria in the New custom device filter window. Name Give your filter a descriptive name, such as "PDF reader and 20 GB disk space" (see Example: create a custom device filter below). Criteria Use the drop-down menu to select the criteria you want to filter on. The drop-down menu will list a set of criteria collected through device audits. You can specify more than one criterion in the filter by clicking on the green plus icon either at the end of the row or underneath a row. For more information, refer to Filter by multiple criteria. Select devices in all of my sites. Select this option if you want the filter to contain devices from every site. Only select devices in the following sites. Select this option if you want the filter to contain devices from selected sites only. Hold the Ctrl / Cmd key for multiple selections and click Include or Exclude accordingly. Share this filter with users in the following security level(s). By default, only filter creators can view, edit, and delete the definitions for a custom device filter. However, you can specify whether you want to share the filter with other security levels within the account. Hold the Ctrl / Cmd key for multiple selections and click Include or Exclude accordingly. The users with whom you shared the filter will be able to open the filter shared with them, see the criteria it uses, and view the results of the filter. They will not be able to edit or delete the filter unless they have Administrator security level. Once the above fields are filled in, click Save. Under Custom Device Filters, click on the newly created filter to see which devices match the criteria. Go to Sites and select a site. Locate the Site Device Filters area in the left navigation pane. Specify the filter criteria in the New filter for site window. Name Give your filter a descriptive name. Add this filter to my other sites Select this option if you want this filter to be available in all of your sites. Share this filter with users in the following security level(s). By default, only filter creators can view, edit, and delete the definitions for a site filter. However, you can specify whether you want to share the filter with other security levels within the account. Hold the Ctrl / Cmd key for multiple selections and click Include or Exclude accordingly. Under Site Device Filters, click on the newly created filter to see which devices match the criteria. Click the plus sign below a criterion. Select the OR or AND operator. If both conditions must be true for a device to be included in the search results, select AND. If either one must be true, select OR. When you add additional criteria, you cannot combine AND and OR. The selection you made first is repeated for any subsequent criterion. Click the minus sign to remove any of the criteria. Click the plus sign next to a criterion. Standard SQL dictates that grouped queries on a positive criterion (e.g. "Software package contains 1", "Software package contains 2", "Software package contains 3") need to be grouped with OR. For example, "Software package contains Adobe Reader OR Foxit Reader OR Sumatra PDF" will return devices that have either Adobe Reader or Foxit Reader or Sumatra PDF installed. Negative queries (e.g. "Software package does not contain 1", "Software package does not contain 2", "Software package does not contain 3") need to be grouped with AND. For example, "Software package does not contain Adobe Reader AND Foxit Reader AND Sumatra PDF" will only return devices that have neither Adobe Reader nor Foxit Reader or Sumatra PDF installed. When you add additional queries, you cannot combine AND and OR. The selection you made first is repeated for the subsequent queries. The Default Device Filters provided by Datto RMM cannot be edited or deleted, however, custom filters can be edited or deleted by their creator. Go to Sites > Custom Device Filters OR Sites > click on one of the sites > Site Device Filters. Hover over the filter you want to edit or delete. Click the pencil icon to edit the filter. Click the Remove filter icon to delete the filter. Deleting a filter will affect anything that uses it as a target, e.g. scheduled jobs or policies. Once a filter is deleted, it can no longer be used as a target. Check the I understand that this action is irreversible check box before clicking the Permanently Delete Filter button. In our example, we will filter for devices that have a software application installed that can open PDF files, such as Adobe Reader or Foxit Reader and have 20 GB of free disk space available. This filter will be applied for the entire account. Go to Sites > Custom Device Filters and click the green plus icon to add a new filter. Give your filter a Name, such as "PDF reader and 20 GB disk space". In the criteria section, specify "Software package contains Adobe Reader". Click the green plus icon at the end of the row (not the one underneath) to add an additional value in this section. Enter Foxit Reader as a new value. Make sure to set the blue and/or button to OR to see any devices that have either Adobe Reader or Foxit Reader. Click the green plus icon underneath to add a new section. Make sure to set the blue and/or button to AND to see devices that match the criteria of the first and second set. In the new section, specify "Disk free space is greater than 20G". Leave the rest of the options at their default selection. Under Custom Device Filters, click on the name of the newly created filter to see a list of all the devices that fit these two sets of requirements.